Get our FREE white paper and definitive guide to Hawaii Beach Wedding Locations. Tell us more about your desired wedding so we can send you the best information about these wedding venues. Please complete the form below and receive your information immediately. Date and Start time are important for us to give you the best suggestions back. See some of our locations below this form. 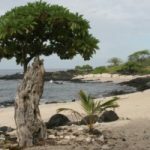 The “Old Airport Beach Park” is the closest and nicest ocean front beach wedding area near the town of Kona. Just a few minutes from Alii Drive take Kuakini Highway North to the beach park. Drive to the end and see the beautiful sandy cove with trees, palms and great ocean vistas. 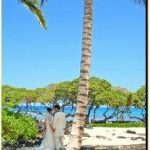 Well known for amazing, colorful sunsets and extremely consistent Hawaiian weather, Anaehoomalu Bay is a favorite for Big Island weddings along the west coast. All around Anaehoomalu beach in Hawaii there are many restaurants to choose from. Seafood, local cuisine and international fare are all available at affordable prices. AKA “A” Bay. 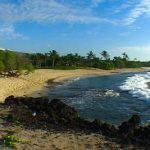 Located on the Kohala coast at the 69 mile marker is this beautiful sand, black lava rock and nice green vegation filled beach. 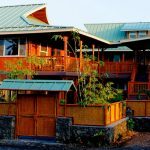 Good privacy but about an hours drive from Kona town. Good choice for those staying Waikoloa area and North. 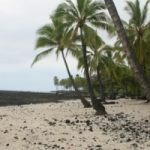 The Only Location on the “Hilo” side of the Big Island of Hawaii is Hakalau Beach park. Located about 20 minutes North of the town of Hilo just past Akaka Falls. Located within the “Four Seasons” resort area. It will be necessary for you to check in at the guarded gate and get a permit for your car. 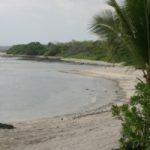 Walk down the beautiful path past natural coastal ponds and other “Hawaiiana” to this lovely beach. Bathrooms, easy parking and a 100 yard walk lead you to your romantic beach wedding site. Usually great sunsets and weather at this location. Kikaua Park has become our most popular location. This gated area offers sand, palm trees, grass, a view of Maui and Mauna Kea, and beautiful surf. Located only minutes north of the airport. This location does require a permit with at least 30 days notice. This location is known for booking up to a year in advance. 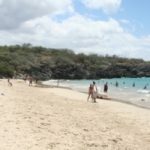 Hapuna beach is very popular and next to the “Prince” Resort. About 45 minutes North of Kona this is a lovely wedding spot early in the morning or close to sunset. Otherwise it is too busy and one should consider “Puako” beach a few minutes south. Our “Newest” favorite location. Located near the Mauna Lani resort just north of Waikoloa this location offer a real “private” feel and is the only location where we are doing beach dinners. The City of Refuge is a National Park and Historic Monument. A beautiful beach lies just south of the Historic grounds (which are prohibited from having weddings). A good deal of privacy and open space exists here. The “Pakalana House” is a private retreat where one can stay, have a reception or both. 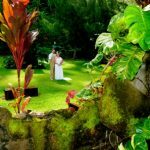 The location of your wedding is probably the most important consideration if you are looking to be married on the Big Island. 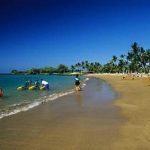 The most popular areas are in Kailua/Kona and Waikoloa areas. Hilo is on the other side of the Island and a great distance from the Kona area. If doing Hilo be sure to ask which ministers and photographers work in that area. Although we can do weddings anywhere on the Big Island we strongly suggest the Kona area as it offers the very best weather and is close to where most tourist stay.Just as important your wedding vendors also live close to Kona.